Well you can’t look a gift horse in the mouth. 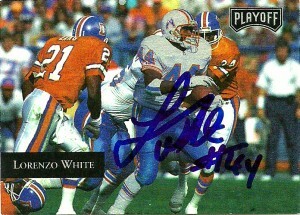 I waited a bit over a year to hear a response from Lorenzo White from the Houston Oilers and Cleveland Browns before putting his post up finally giving up in late July. 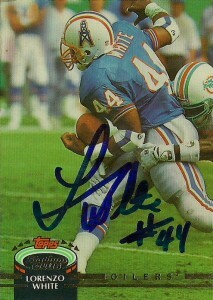 Nothing is so nice as to get an autograph TTM after you’ve truly given up on getting it back, so almost like clockwork postmarked on July 29th Lorenzo White signed 2 of 3 cards, (minus his awesome ProSet 1990 card) from Fort Lauderdale, Florida where he’s now a high school football coach. I was happy and surprised to get this one back. So as discussed previously, Topps was really stepping up their quality with their Stadium Club entry. It was so different than their starter base set, that it really helped them weather the trading card storm yet to come. Playoff was also a late entry to the market, with the cards made of an extremely light metal. The scan here does the expensive card no justice, but the quality and reflective shine really added to the quality of the brand. Combined with its minimal design, Playoff made a nice splash into the market and remains one of the survivors today- but have since abandoned the metal foil look on their cards. As you can tell when comparing this to the other cards in this library, these are definitely autographed while the others are stamped. Lorenzo is considered the greatest runningback in Michigan State history. He currently coaches high school football in Ft. Lauderdale, Florida, He also has a son, Lorenzo White Jr. who is currently a defensive back at Central Michigan.